When communicating with your sales team, customers and prospects will often note "product gaps" - functionality they need that is missing from your product. These product gaps may be a blocker for a sale or expansion. Our Salesforce Feedback and Opportunity Integration enables your sales team to capture this critical feedback. This allows you to unblock sales opportunities faster by knowing what customers need. 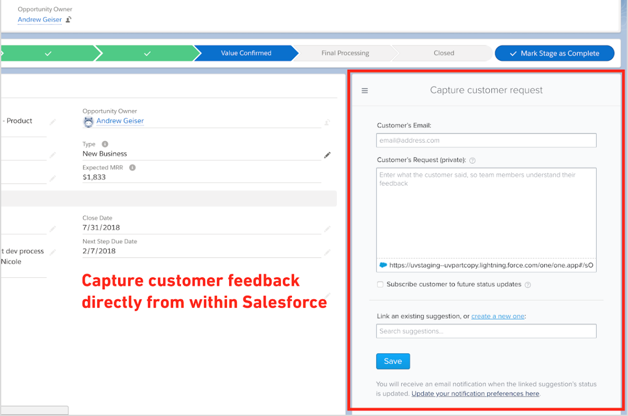 Please note: In order to view or capture feedback, each Salesforce user will need to have a UserVoice Contributor license. These licenses are managed by your UserVoice administrator. This integration can be used with Salesforce Lightning or Salesforce Classic. The “UserVoice Feedback” object is defined in Salesforce and populated from UserVoice. This is a one-way sync. It is important that users not make any modifications to these records in Salesforce since any changes will not be synced back to UserVoice. It is currently up to Salesforce admins to make the UserVoice Feedback object read-only for users who need to view these records or create reports from them. Unauthorizing a Salesforce Org will not delete the data stored in UserVoice. If you reauthorize the same org or any other, the previous data will still be displayed and added to reports within UserVoice. The integration requires an available Dynamic Dashboard. The integration is not compatible with Salesforce Professional Edition, or Essentials. The integration works with both Salesforce Lightning and Salesforce Classic, but the way feedback is viewed and captured within Salesforce will be a bit different for each. 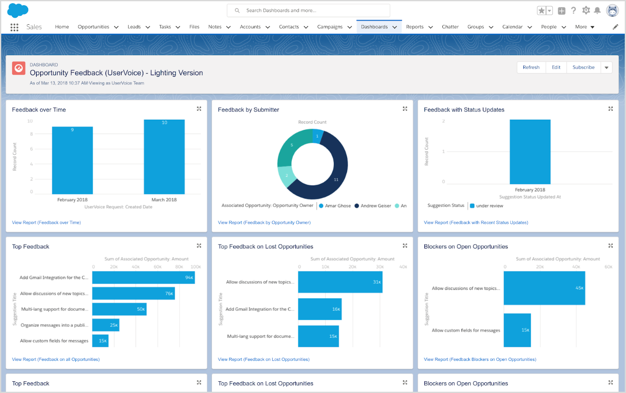 In Salesforce Lightning, a new UserVoice Feedback component is available that allows team members to capture customer (and prospective customer) feedback directly from Opportunities and other objects. Any feedback that is captured from that page will also be visible to other team members. As the status of opportunities is updated in Salesforce, that will be reflected in the UserVoice Suggestions and Features grids. In the Salesforce Classic experience, you can add a “UserVoice Feedback” button that opens the feedback component in a sidebar. From here, team members can review existing feedback and capture new feedback from customers and prospects. 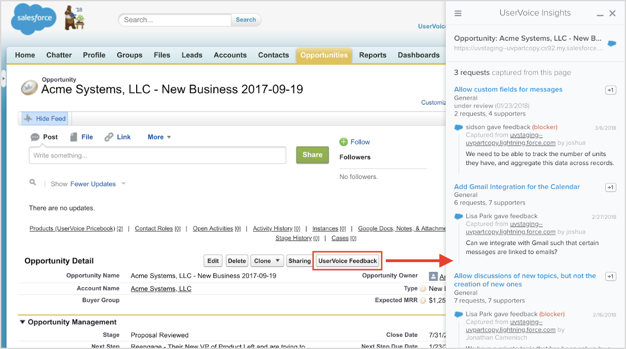 As the status of opportunities is updated in Salesforce, that will be reflected in the UserVoice Suggestions and Features grids. In UserVoice, you can quickly see which product gaps are preventing Sales from winning opportunities. When viewing Features and Suggestions, UserVoice admins can see associated Open Opportunities and Potential Revenue, Lost Opportunites and Lost Revenue, and percent of Opportunities and Revenue Won. 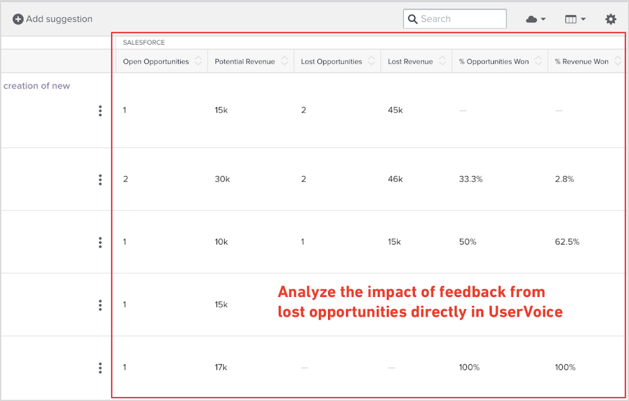 In Salesforce, the "Feedback Opportunity Dashboard" includes reports to help your team track how much feedback is coming from Sales and how the Product team is responding to that feedback. Validation rules (ex: require feedback to be logged on specific types of Closed-Lost deals) help Sales leaders ensure that feedback is always being captured when it should be. Q: Why don't I see the option for this integration on my account? A: It may not be included on your current plan. If you're unsure, please reach out to us, and we can help with any questions.